Today there are two Church of Ireland churches in Limerick City – Saint Mary’s Cathedral on King’s Island and Saint Michael’s Church on the corner of Barrington Street and Pery Square. Saint Michael’s Church, which was consecrated in 1844, replaced an older church, Saint George’s on George’s Street, now O’Connell Street, which was founded in 1789. Saint Michael’s is also known as ‘the sinking church’ as it was not built on bed rock and has sunk ever so slightly over the years. Saint Munchin’s Church was built as a Church of Ireland parish church in 1827. The architects were the brothers George and James Pain, who built the church in the Gothic style, with four pinnacles at the top of the tower. Saint Munchin is the patron saint of Limerick. There are many legends about Saint Munchin, who is said to have lived in Limerick in the late seventh century. Saint Munchin’s Church is on King’s Island, between the Bishop’s Palace and the Villiers Alms Houses. It was built in 1827 and was renovated in 1980 by the Limerick Civic Trust. It was a used for a period by the Island Theatre Company and is now used as a store for Limerick Civic Trust. Saint John’s Church stands on the site of an earlier church in the Irish town area of the city, which dated from the 1200s. It is located at one end of Saint John’s Square, the first development of Newtown Pery. The walls around the graveyard were built in 1693 and the present church was built in 1852. The graveyard is the burial place for many Limerick merchant families, including the Russells, who ran the largest mills in Limerick in the mid-19th century. The church fell into disuse in the early 1970s as the Anglican population of Limerick city declined in numbers. It was transferred to Limerick Corporation in 1975. The interior was completely redesigned and for a period the church was used as a base for the Dagdha Dance Company. It is now the hub for Dance Limerick. One Anglican church in Limerick that stood outside the diocesan and parochial systems for many years is Trinity Church on Catherine Street. I sometimes pass this former church on my way between buses in Limerick, but it must be easy to pass by without noticing the building because of the way it has been integrated into the streetscape of Catherine Street. Trinity Church was designed by the architect Joseph Fogerty and was built in 1834 as a chapel for a nearby Asylum for Blind Women through subscriptions raised in Ireland and England by the Revd Edward Newenham Hoare (1802-1877). Edward Newenham Hoare was a Church of Ireland priest and the author of religious tracts and fiction. His father, Canon John Hoare from Drishane, near Millstreet, Co Cork, was the Canon Chancellor of Saint Mary’s Cathedral, Limerick and Vicar-General of the Diocese of Limerick, and as Rector of Rathkeale (1803-1813) he was one of my predecessors. Edward’s mother, Rachel (d. 1850), was a daughter of Sir Edward Newenham MP. Edward Hoare was born in Limerick on 11 April 1802 and was educated at Trinity College Dublin (MA 1839). He was a curate of Saint John’s Church, Limerick, in 1830-1831 and later was Archdeacon of Ardfert (1836-1839). In the 1830s, Hoare was also the editor of the Christian Herald, and he published a number of sermons too. Around 1831, he first proposed opening a chapel for the blind in Limerick, but his plans were opposed by the then Bishop of Limerick. But Hoare appealed for subscriptions throughout Ireland and the England, and the new church was built as a place of worship for the adjoining asylum for blind girls and women. The new classical church was designed by the architect Joseph Fogerty and was consecrated and opened on 4 May 1834. Perhaps it was named after Holy Trinity Church, Rathkeale where Hoare’s father had been rector earlier in the 19th century. This was an attached three-bay, two-storey over basement limestone, pedimented church. It was flanked on both sides by a pair of attached two-bay, three-storey over basement red brick townhouses. The central building is built entirely of smooth limestone ashlar. It has a recessed central double-height entrance bay with a pair of giant order Ionic columns, flanked by a pair of giant order Doric corner piers, flanked by similar giant order Doric pilasters. These support a plain architrave and frieze. The central recess is surmounted by a pediment forming a shallow breakfront, and continuing as a heavy cornice to either side. A stringcourse is located at the first-floor level with channel rusticated walls to the ground floor level. A large round-arched window opening with a panelled apron dominates the first-floor level of the recessed portico, with an arched 10-over-15 timber sash window. Flanking the portico are single round-arched window openings with panelled aprons containing six-over-nine timber sash windows incorporating a spoked fanlight with margin lights. There are square-headed ground floor window openings, each with a limestone sill and an apron underneath, with six-over-six timber sash windows with margin lights. Three square-headed door openings with double-leaf timber-panelled doors are located at the ground floor level of the portico, opening onto a limestone platform and a stylobate of five steps. The flanking buildings have red brick walls laid in Flemish bond with cement repointing with concrete coping to the rebuilt parapet walls. There is a limestone plinth course at the ground-floor level over painted rendered basement walls. The gauged brick flat-arched window openings have patent reveals and limestone sills. There are replacement six-over-six timber sash windows. There are gauged brick round-arched door openings to each building with patent reveals, modern replacement carved timber door surrounds and overlight and panelled doors, dating from about 2000. There is an in-filled basement to the south-flanking former house with a modern wheelchair ramp and replica spearhead railings, all dating from about 2000. The north-flanking former house has a concrete platform and four limestone steps that are flanked by replica spear-headed railings on a limestone plinth enclosing the basement. Edward Newenham Hoare gave his name to Newenham Street in Limerick. He was Archdeacon of Ardfert (1836-1839), and was later Dean of Achonry Cathedral from 1839 to 1850, and Dean of Waterford from 1850 until his death. His first wife was Louisa Maria O’Donoghue from Portarlington, and their children included Revd John Newenham Hoare of Muckross and Revd Edward Newenham Hoare, Rector of Acrise, Folkestone, Kent. In 1859, he married his second wife, the twice-widowed Harriet, daughter of Colonel George Browne. Hoare died in Upper Norwood, London, on 1 February 1877 and he is commemorated by a plaque in Christ Church Cathedral, Waterford. Hoare’s church was designed by the Limerick-born architect and builder Joseph Fogerty (1806-1887) who had a lucrative practice in the city. He was born into a family of builders working from Saint John’s Square in 1824 and from Newtown Pery by 1840, and was baptised in Saint Mary's Cathedral on 9 March 1806. His other works included the Theatre Royal in Henry Street (1841) Leamy’s Free School (1841-1845), a Tudor Revival building on Harstronge Street, and several houses in Limerick, and he worked in partnership with his son Robert Fogerty (1843-1917) from offices in Henry Street until his death in 1887. The apse in the church was added by Joseph Fogerty’s nephew, William Fogerty (1833-1878), in 1858-1859 at a cost of £500. Joseph Fogerty’s son, Robert Fogerty, removed the old gas fittings in 1895 and designed extensive alterations and improvements to the church, including new art metalwork, brass light fittings and a new lectern. The church reopened on 7 November 1895. The building has been in government use since the 1960s, when the church was converted to office use on behalf of the local health board. The building is now used by the Health Service Executive (HSE). The interior of the building was gutted around 2000, when the galleries were removed and an attic-storey added to all three structures. There is a flat roof with an artificial slate mansard front and sides with lead covered dormers containing uPVC windows. The cut limestone centrepiece and the two flanking former houses appear to have been radically altered in recent years. But this set of three buildings on Catherine Street remain a fine architectural composition and they form a pleasant aspect in this intact streetscape in the heart of Limerick. In my strolls between connecting buses in Limerick, I have come to admire the former Presbyterian Church on the corner of Henry Street and Lower Mallow Street in Limerick. This is a very fine red brick and Portland stone church, displaying a wealth of stone carving and ornamentation. The church was designed by the architect George Coppinger Ashlin (1837-1921), who had married AWN Pugin’s daughter, Mary Pugin (1844-1933), in 1867. At the time, Ashlin was in partnership with Thomas A Coleman (1865-1950). Ashlin and Coleman were the architectural heirs to the legacy and work of Pugin in Ireland. The majority of their work was in Leinster, and this church is one of their the few commissions in Co Limerick. The only other church by Ashlin and Coleman that I have identified in Limerick is the much later Saint Mary’s new church, built in the 1930s near Saint Mary’s Cathedral (Church of Ireland) on the site of a church first built in 1749. Indeed, the church on Henry Street was the only commission Ashlin and Coleman received from the Presbyterian Church. The Presbyterians in Limerick claim they can trace their origins in the city back to a small group of Calvinist Dissenters from Scotland who settled in Limerick around 1549. These early Scottish Dissenters later rented what had been old chapel of the Augustinian Nunnery in Pump Lane, outside the walls of the city and close to Saint Mary’s Cathedral. The first Augustinians in Limerick were nuns known as the Canonesses of Saint Augustine, and their house was founded in 1171 under the patronage of Donal O Brien. It was dedicated to Saint Peter and was known as Saint Peter’s Cell. Their house was suppressed along with other monastic houses at the Reformation, and it eventually passed to the Damer family. It was used by the Presbyterians until the second half of the 18th century. However, no traces of the original Augustinian foundation survive, and the site of their house is now part of the grounds of Saint Mary’s Convent School. Meanwhile, the heirs to these Scottish Dissenters built the Dissenters’ Meeting House in Pump Lane in 1765. As the congregation grew in size, their meeting house was replaced 200 years ago with a new church built in 1817 in Glentworth Street. But the church in Glentworth Street also soon proved to be too small, and it was enlarged in 1829 and a gallery was added in 1846. Despite these additions, a new church was needed by the end of the 19th century, and a site was acquired on the corner of Henry Street and Lower Mallow Street. Building work on this new red-brick church started in 1899, and the foundation stone was laid by the Moderator of the Presbyterian Church in Ireland, the Right Revd Dr David Alexander Taylor. It is said that when the foundation stone of the new church was laid, Archibald Murray gave an historical sketch, and a bottle was deposited at the right-hand corner, listing the names of the Presbyterian minsters in Limerick from the reign of Charles I to October 1899. Along with it were a copy of the Limerick Chronicle and current coins of the realm, from a sovereign to a farthing. The new church was opened on 3 October 1901 by the Right Revd Professor James Heron, Moderator of the General Assembly of the Presbyterian Church in Ireland. The church was built for a congregation of 500 people and cost £6,000 to £8,000 to build. The builders were John Ryan & Sons, of Limerick and the surveyor was W. Morris. Reflecting the influences of Pugin inherited by Ashlin and Coleman, this church is built in an Early English Gothic Revival style on a rectangular plan, with Ruabon brick and Portland stone dressings. There is a three-stage corner tower and a three-sided apse to the liturgical east or geographical west. There are four gabled bays to the north and south elevations, with narrow gabled transepts attached to the north and the south. There is a pitched natural slate roof with decorative ridge tiles and a glazed central section. There are flower finials to the gables and a weather vane on the tower roof where other churches might have a cross. Machine-made red bricks were used in the walls, which are in English garden wall style, with Portland stone platbands, stringcourse, plinth course and dressings. A rose window designed in Portland stone dominates the liturgical west (east) elevation, and below it there are five narrow lancet windows. Two-stage buttresses flank a pointed arch door opening formed in brick and Portland stone with drip moulding and chamfered reveals. The double-leaf timber doors are made of herringbone timber planked with original flat-iron hinges. The corner tower has a lead roof with limestone dentillated eaves. There is a Portland stone pointed arch opening with a roundel over a pair of trefoil headed openings on the upper stage. Narrow lancets can be seen on the first floor level. A door of similar detail to above is located on the east side elevation of the ground floor. These two doors have limestone steps flanked by brick parapets with limestone coping. Each of the aisle bays on the north and south elevations has modern glazing recessed behind bipartitie tracery windows with a quatrefoil roundel above and a new square headed window opening below. There is a date stone inscribed 1899 under a small window on the liturgical south (north) transept. There are flat pointed arch window openings to the basement. The pairs of windows on the octagonal apse are treated in a similar way to those on the north and south elevations. The church was surrounded by ornamental bars and had five steps up to the front. An unusual feature was the lecture hall beneath the church. Gas provided the early system of lighting until electricity was installed in 1915. Meanwhile, when the new church in Henry Street Church was completed, the Presbyterians sold their old church on Glentworth Street to the printing business of George McKern & Sons in 1904. McKern’s is now owned by the Morris family and still carries on its printing business in the same premises. It is hidden away down a little alley, beside Saint Saviour’s Dominican Church, which makes it very difficult to photograph. The Presbyterians stopped using the church on Henry Street in the 1970s. 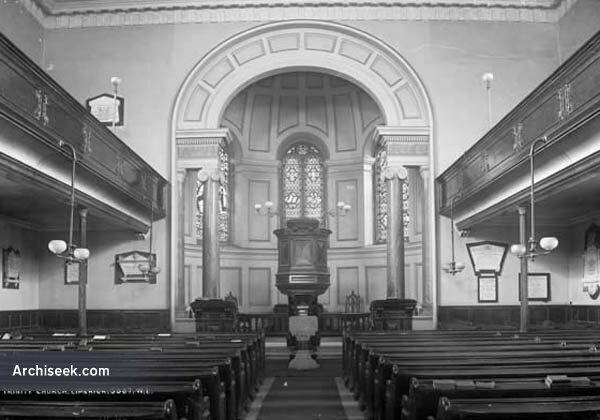 The Presbyterian Church in Limerick then amalgamated with the Methodist Church and the two formed a united congregation in Christ Church on O’Connell Street, Limerick. For a short time, the former church on Henry Street was used as a courthouse. A local businessman and former international rugby player Pat Whelan bought the premises ca 1990. After extensive renovations ca 1995, the church is now in commercial use as an office building, and the lecture hall has also been converted into offices. Looking at this church from the outside, the conversion to office use seems to have been visually sensitive, although I did not see inside the building. It is now surrounded by high-rise modern developments, and it is of great importance to the streetscape in Henry Street as a splendid example of what the street once looked like.